This is my first currently and I'm so excited for it! I got it over here, from Oh' Boy 4th Grade! I've never done one before so I hope I did it right! Listening: Food Network Star is my new addiction and I'm absolutely obsessed! I watched all of season 8 in three days (totally by accident...). Loving: That it's almost the 4th of July! I absolutely love the 4th! Mainly because my birthday is the 5th! But also because we always go down to Salem and see my Poarch's for the 4th! I cannot wait! I miss my girls so much and I cannot wait to see them! This is also Tony's first year going and I'm excited to share the amazing experience with him! Thinking: I don't update nearly as much as I should, or as much as I want too! 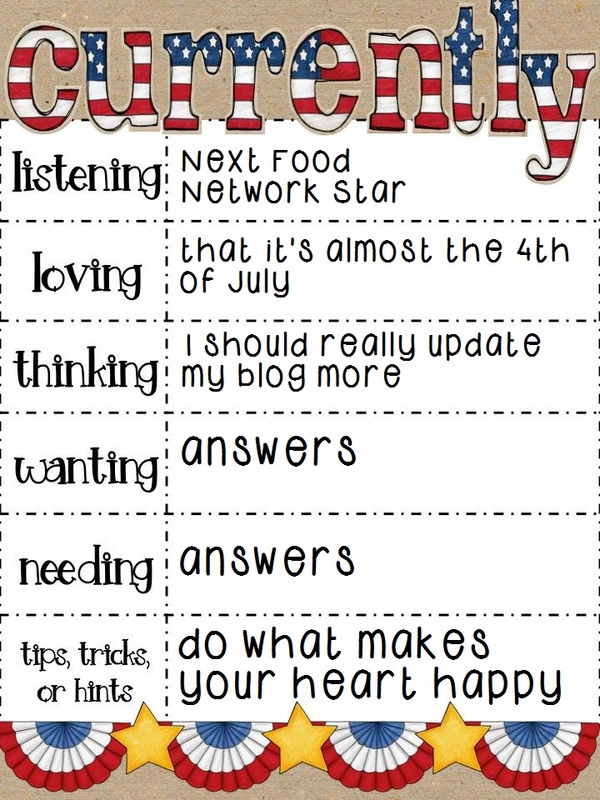 I'm trying to come up with some kind of schedule to keep me blogging! If anyone has any tips, please share! Wanting: Answers. I've been going through some medical problems the past few months and I'm really just needing and wanting answers as to what's going on with my body. I've also been going through a lot in my personal life and I wish I had answers as to why things aren't working out for me. I'm trying to keep it positive, I really am, but it's getting hard, especially with everything that's been going on. Tips, Tricks, or Hints: Do What Makes Your Heart Happy! I'm trying really hard to learn to do this. I've made some rash decisions in my past and I'm regretting some of them recently. But by doing what makes my heart happy, I'm learning to get better!